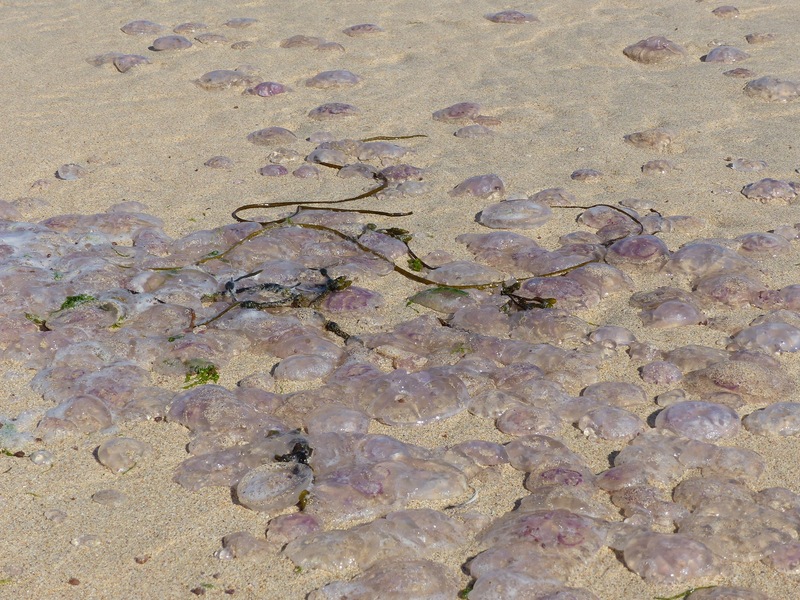 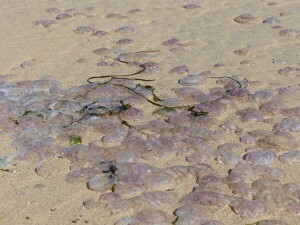 This week’s Kids Club will long be remembered as the one where we shared the beach and the water with millions of moon jellyfish! 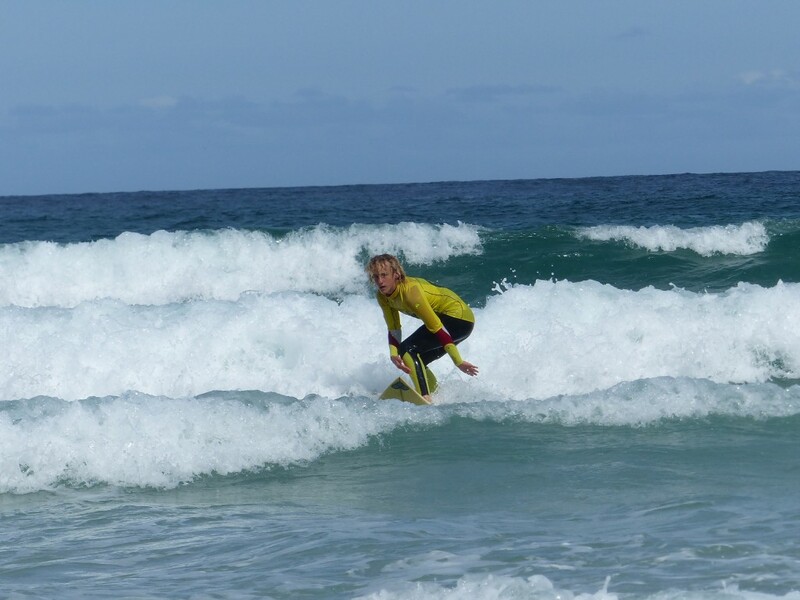 We arrived on the morning to find strand lines of them from the high water mark all the way to the ocean – and then found more in the sea once the session got underway. 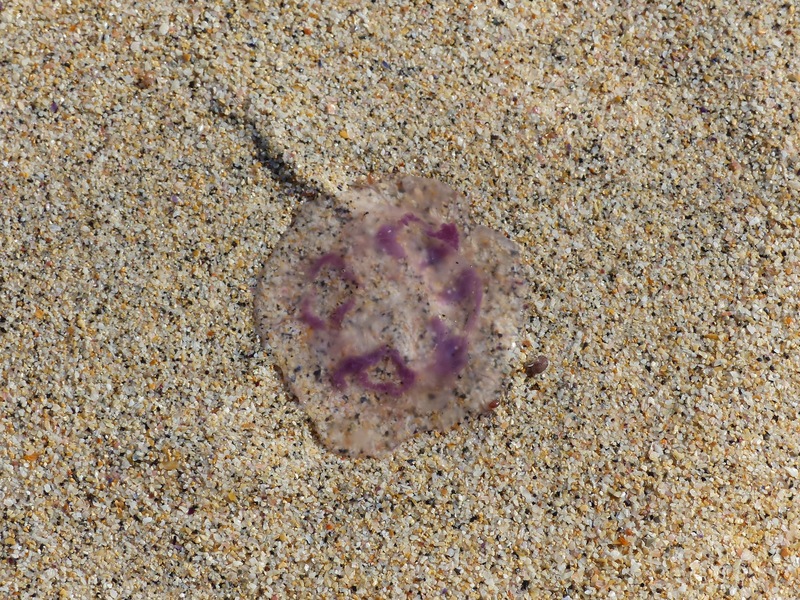 Moon Jellyfish ( Aurelia Aurita ) have a very mild sting which humans find imperceptible, and there seems to be a growing trend to keep them as pets in an aquarium apparently! 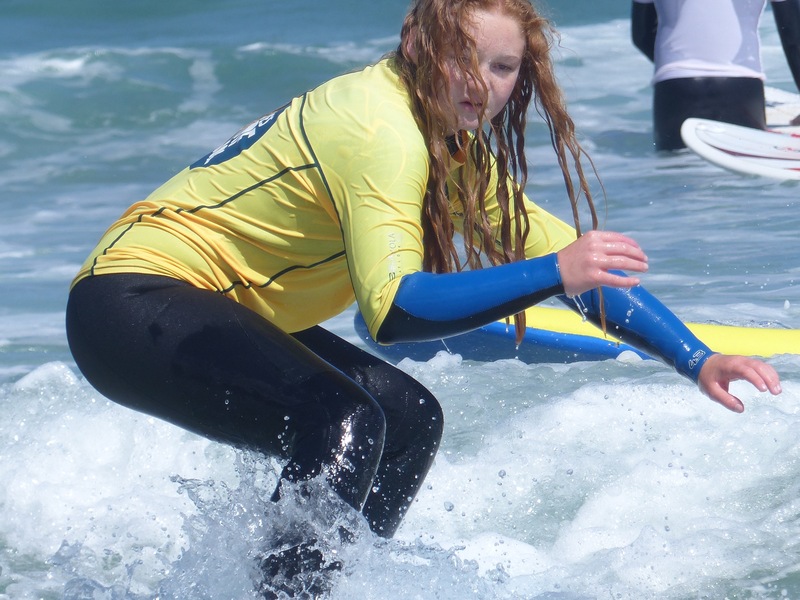 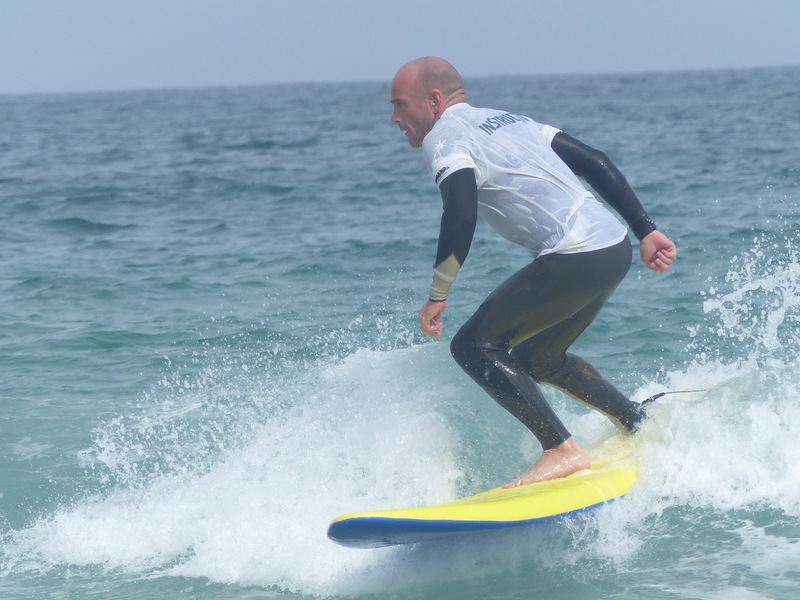 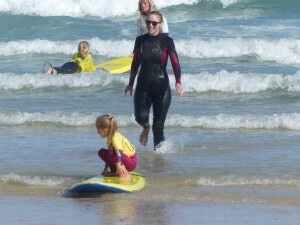 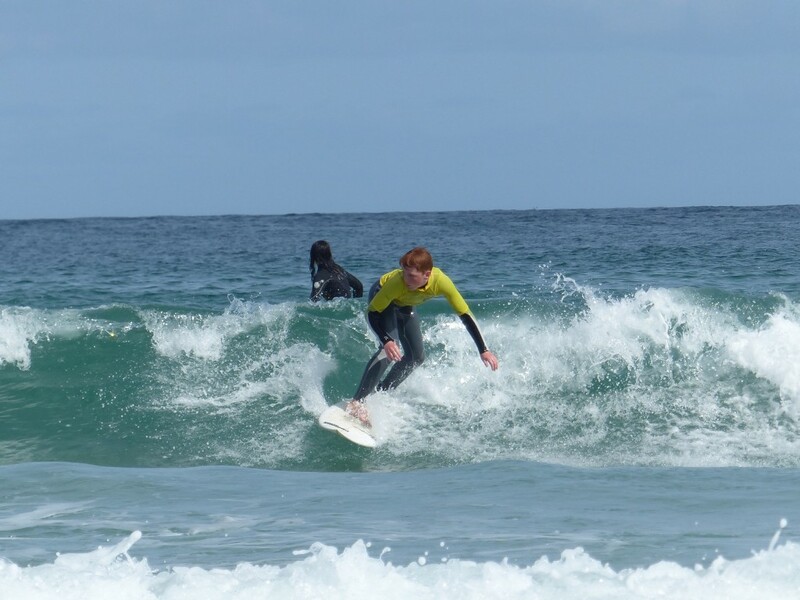 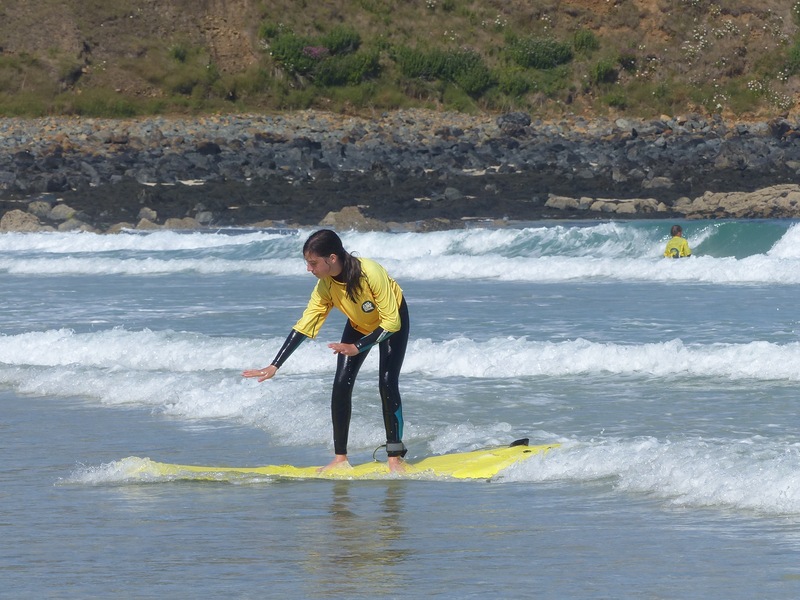 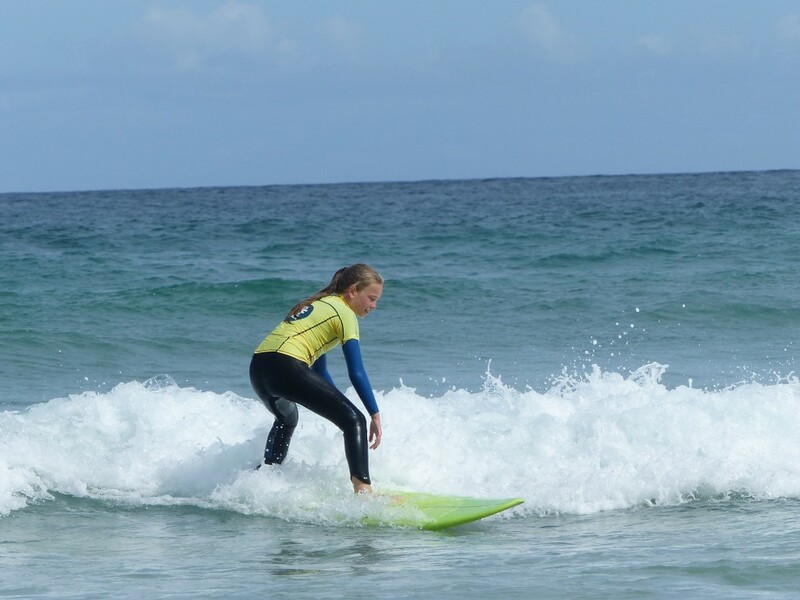 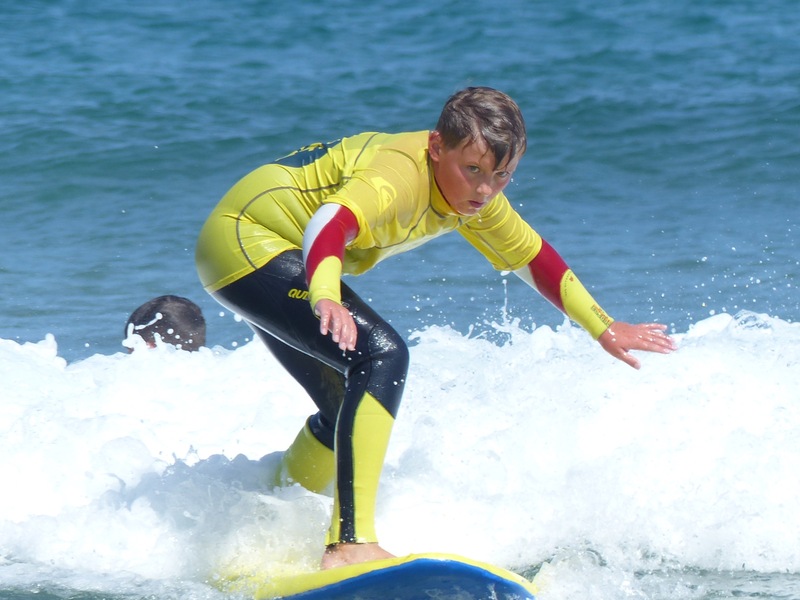 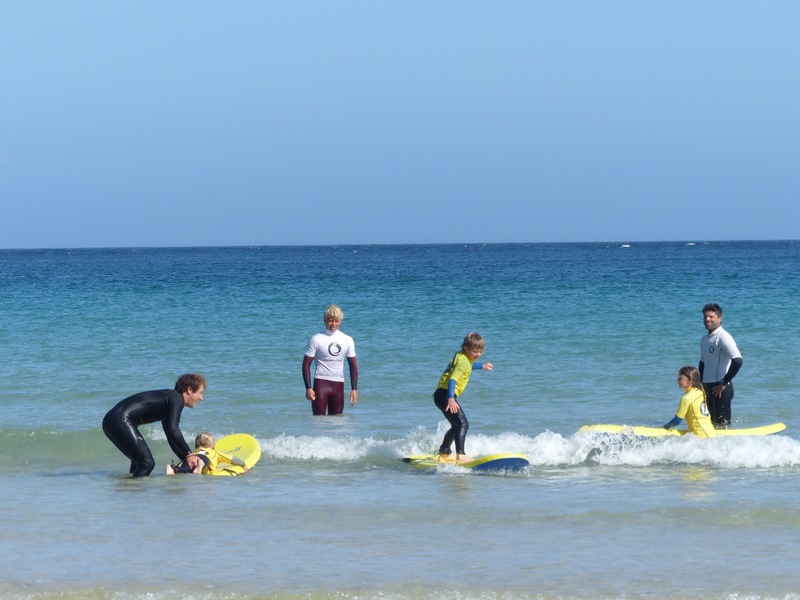 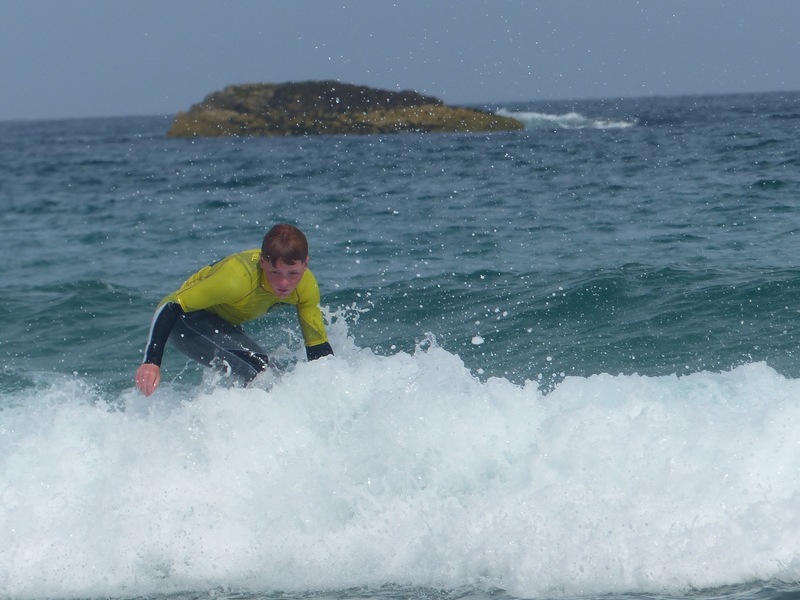 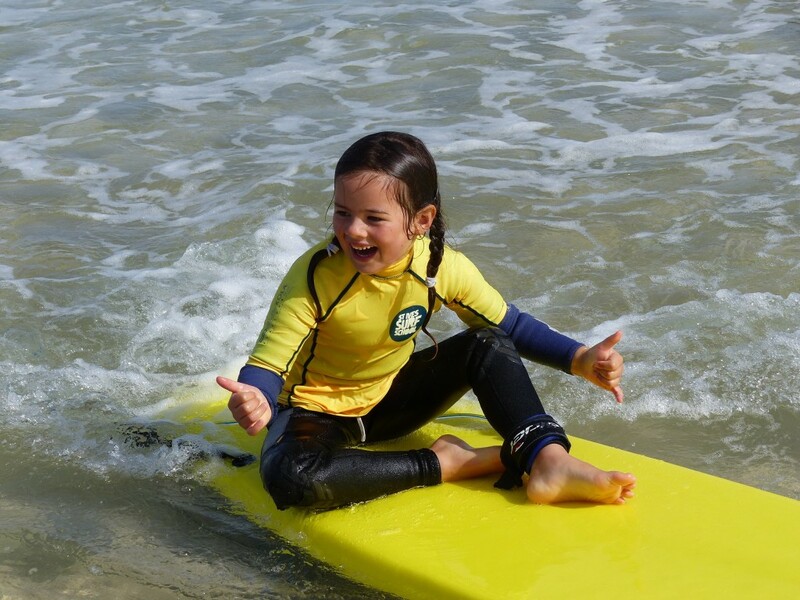 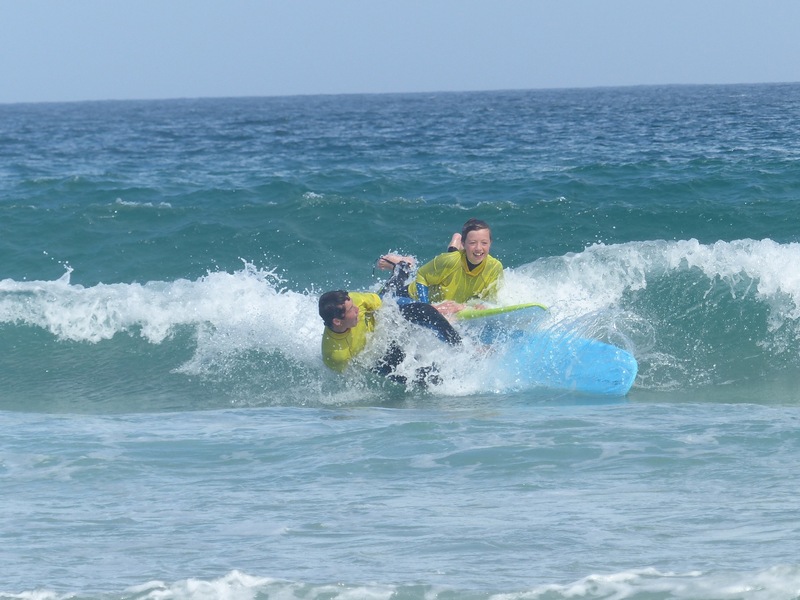 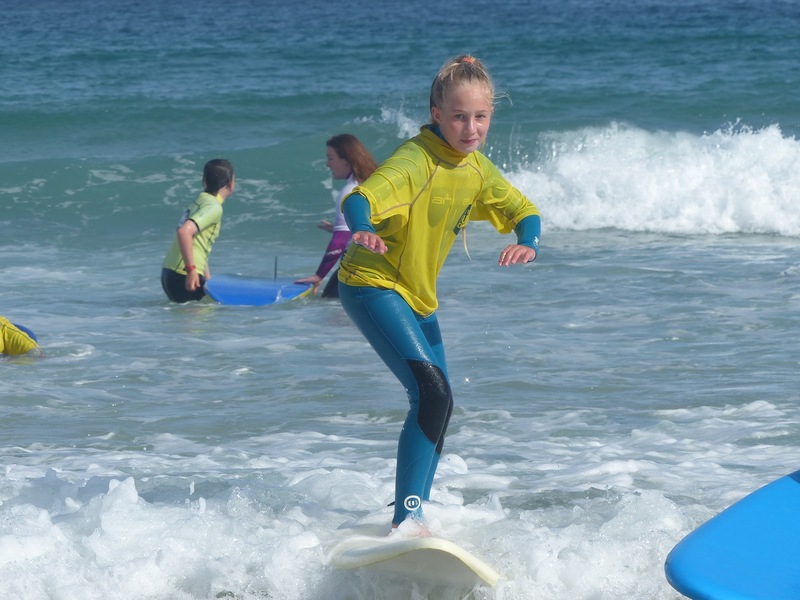 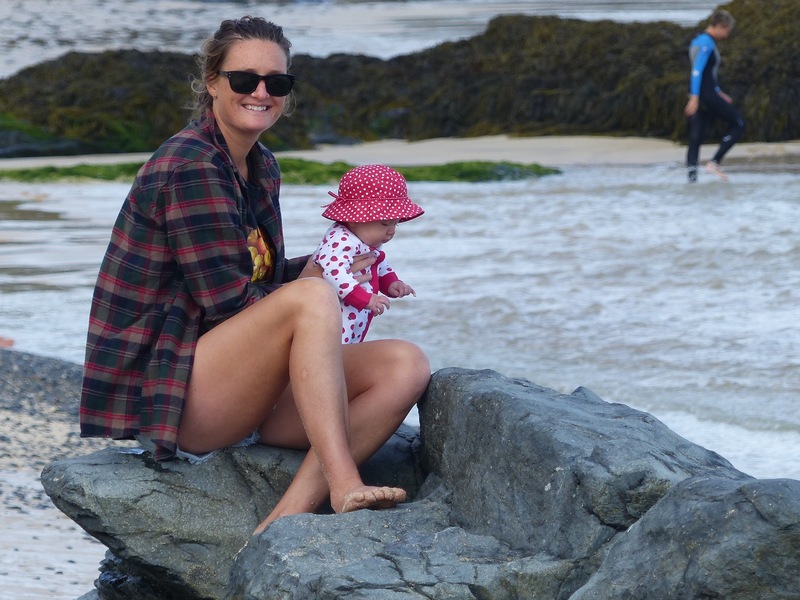 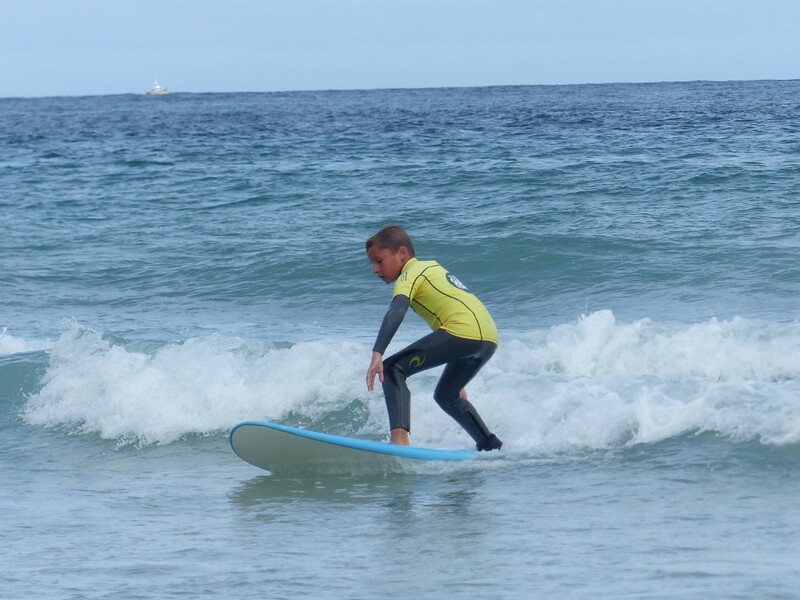 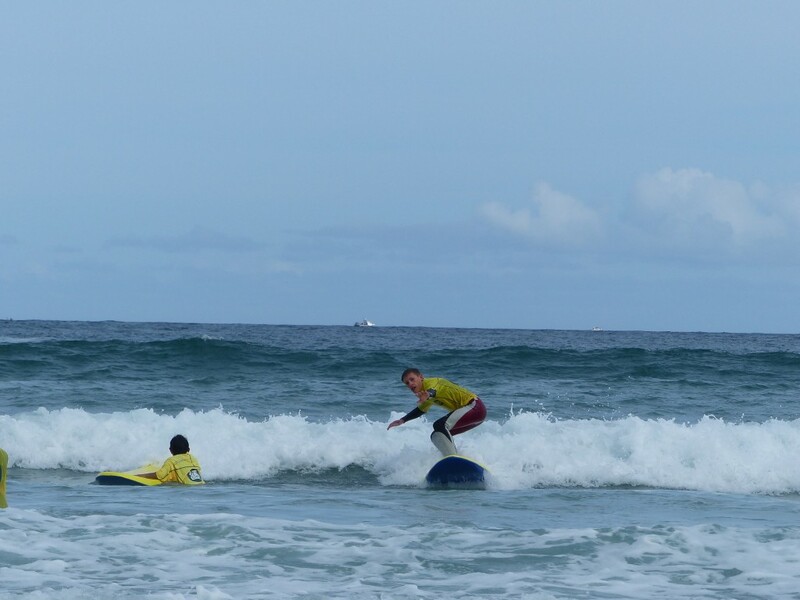 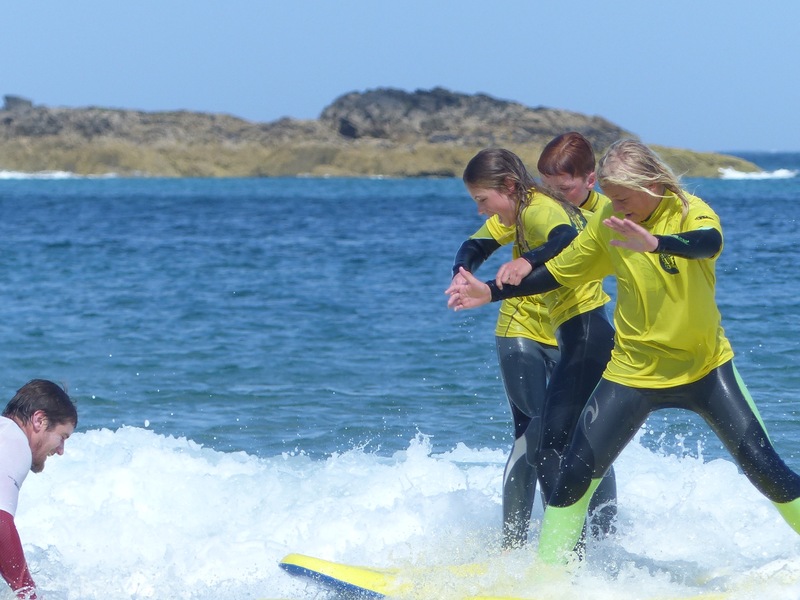 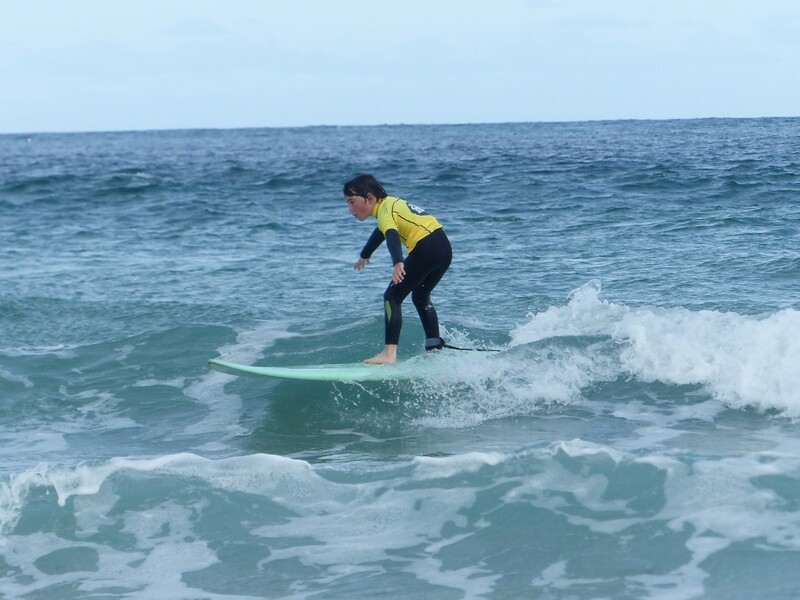 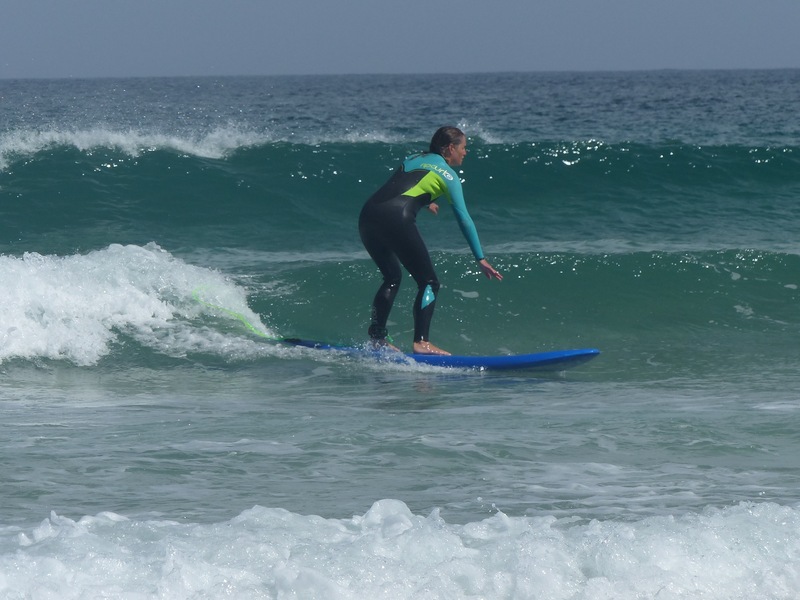 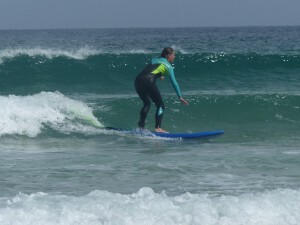 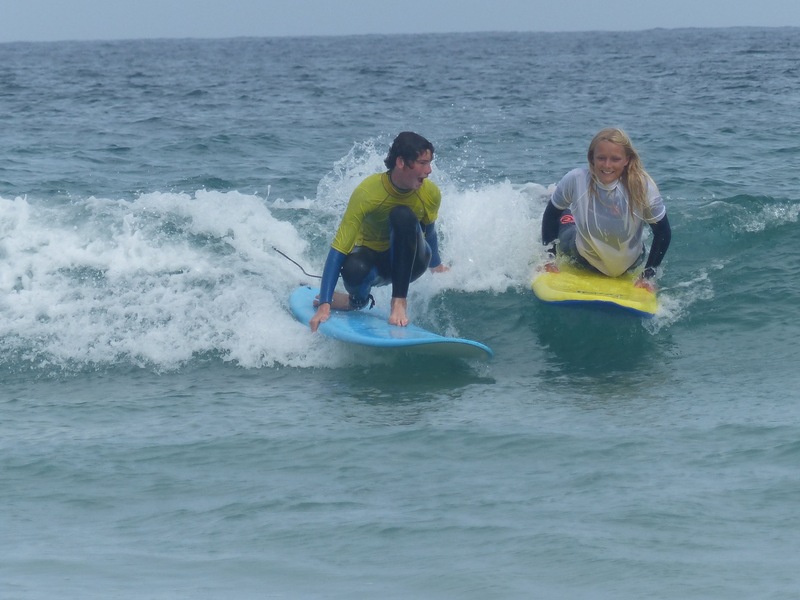 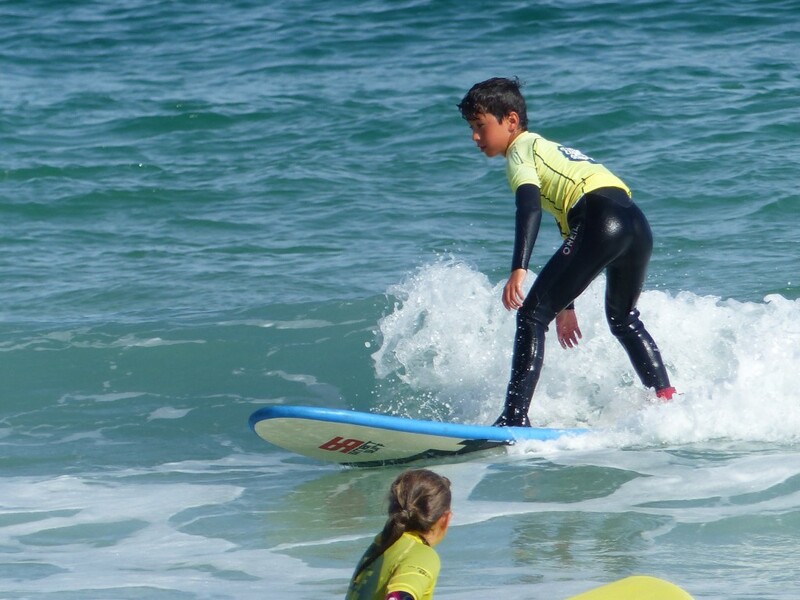 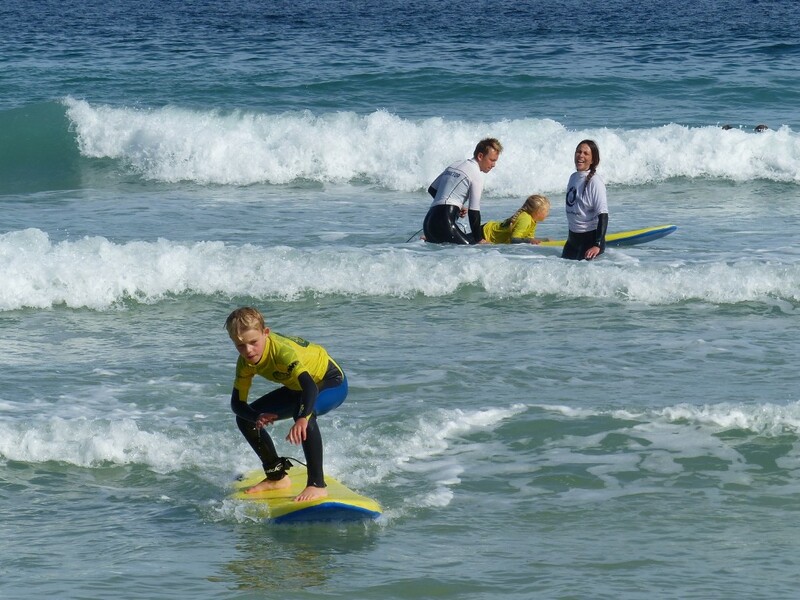 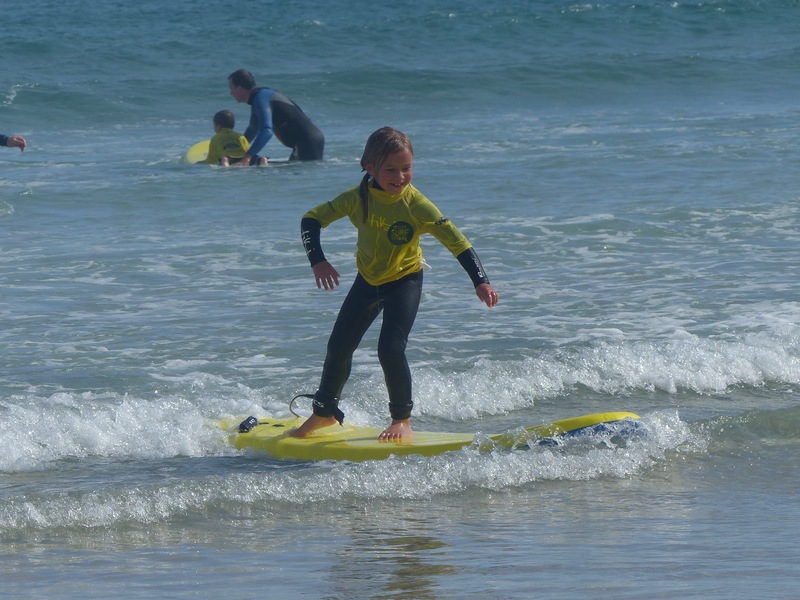 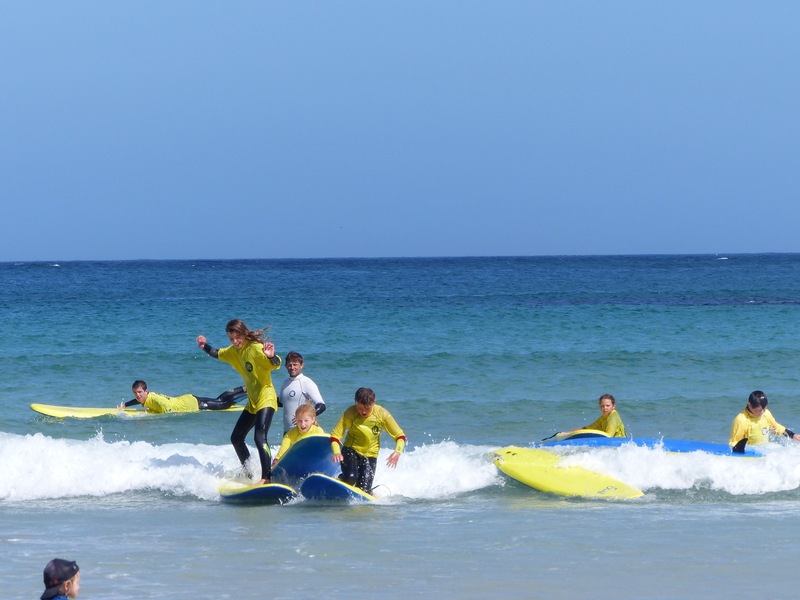 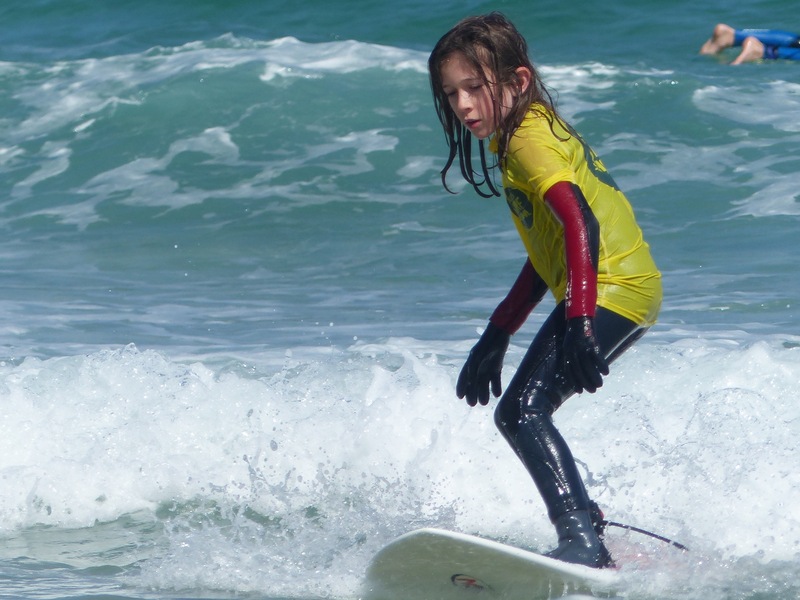 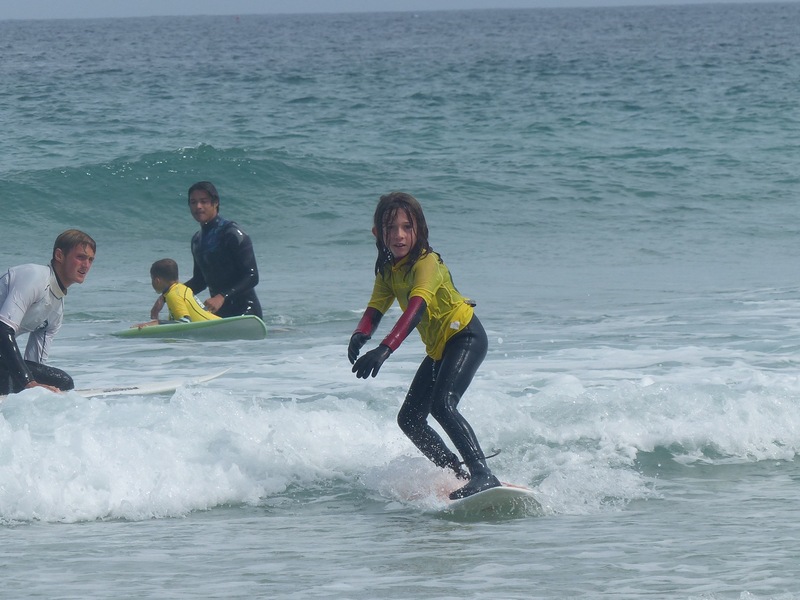 Fortunately, even the most squeamish among us soon set our anxieties aside, and the pre-surf lessons plans were put into practice as the warm-ups, then surfing, got underway. 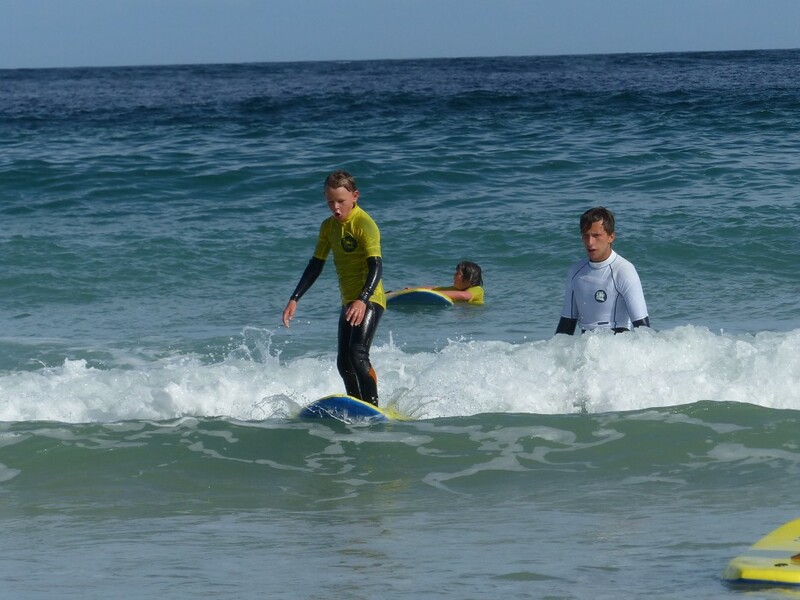 Our early start was particularly helpful on the day, as the busiest weekend of the holiday season saw the beach and the sea rapidly filling with people as we concluded our sessions at 11 o’clock.Surf conditions were again favourable for both Swellboards and hardboards, continuing our lucky run of Saturday morning surf. 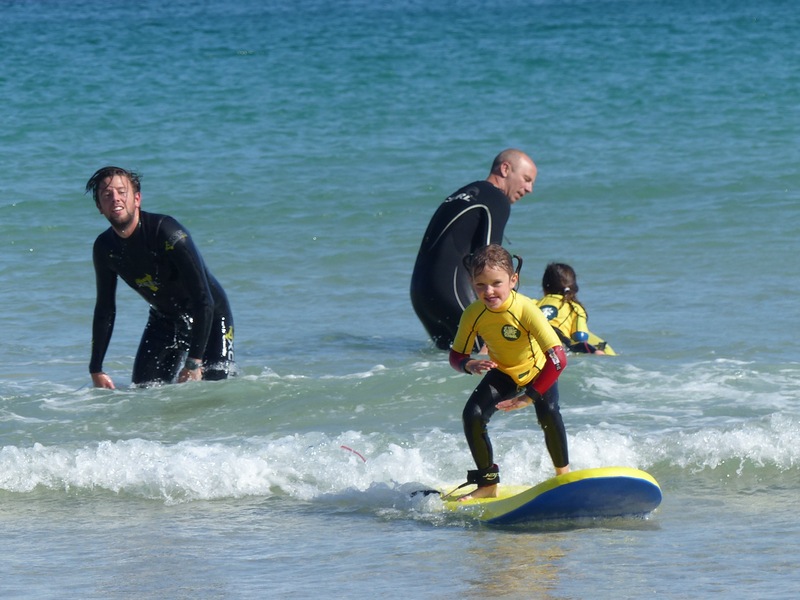 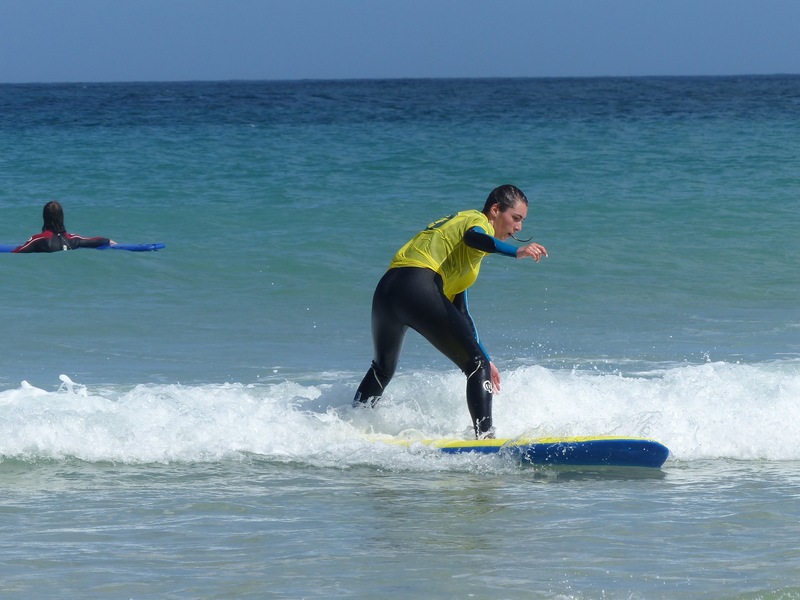 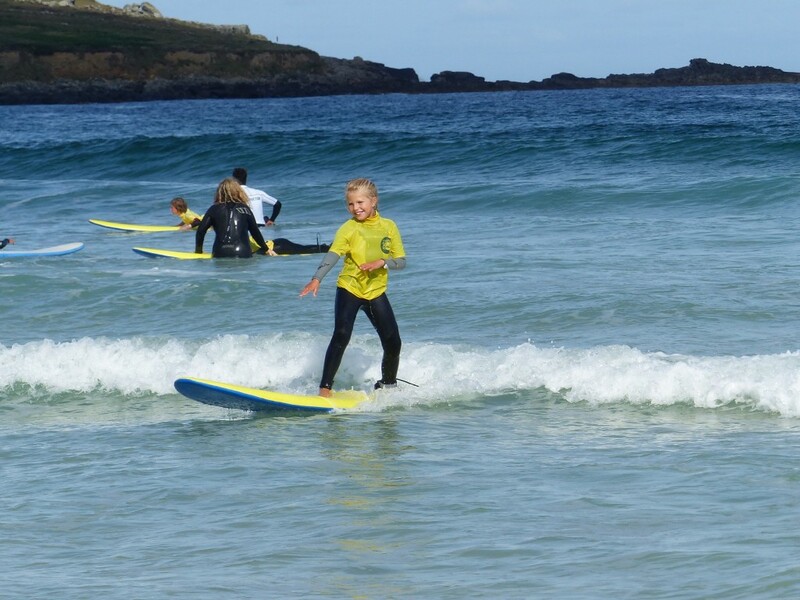 Well, the last couple of Saturday mornings have given us both surf and some fine weather – and that has meant bumper attendance figures for both days. 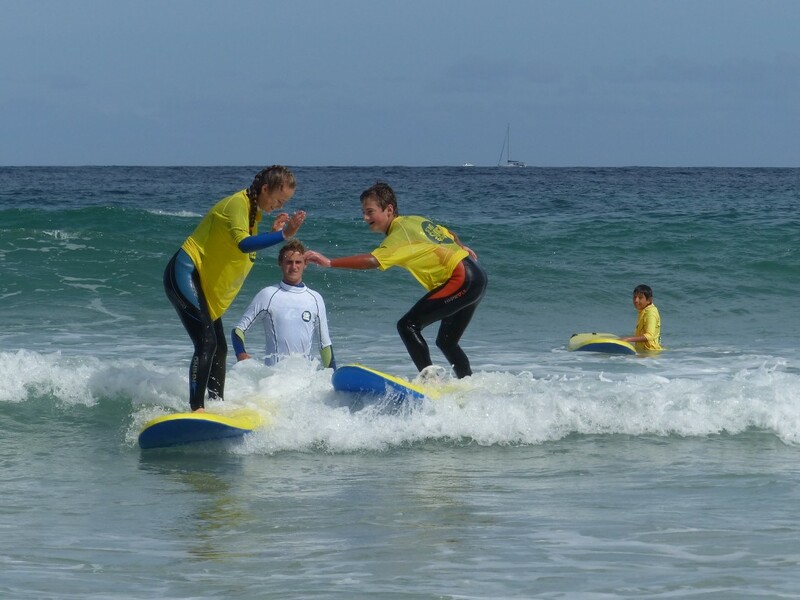 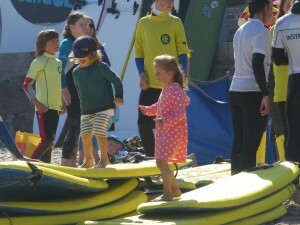 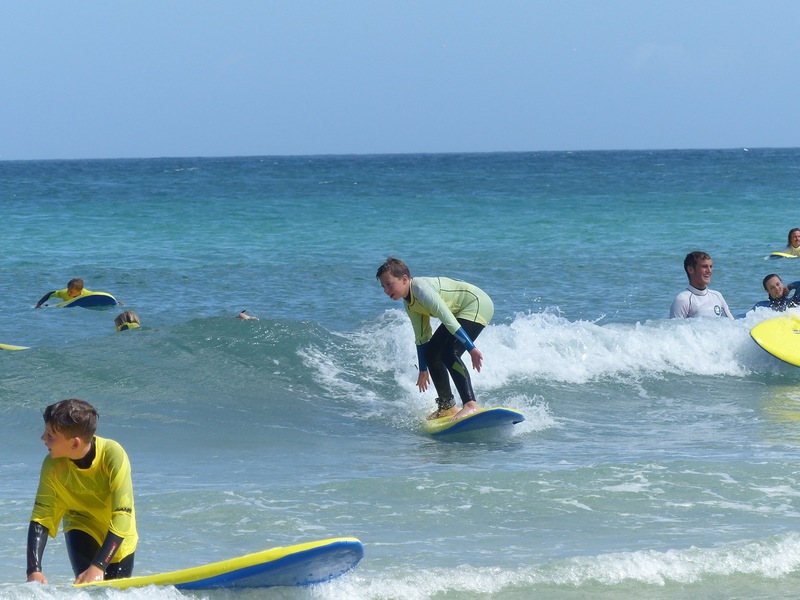 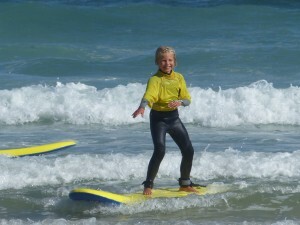 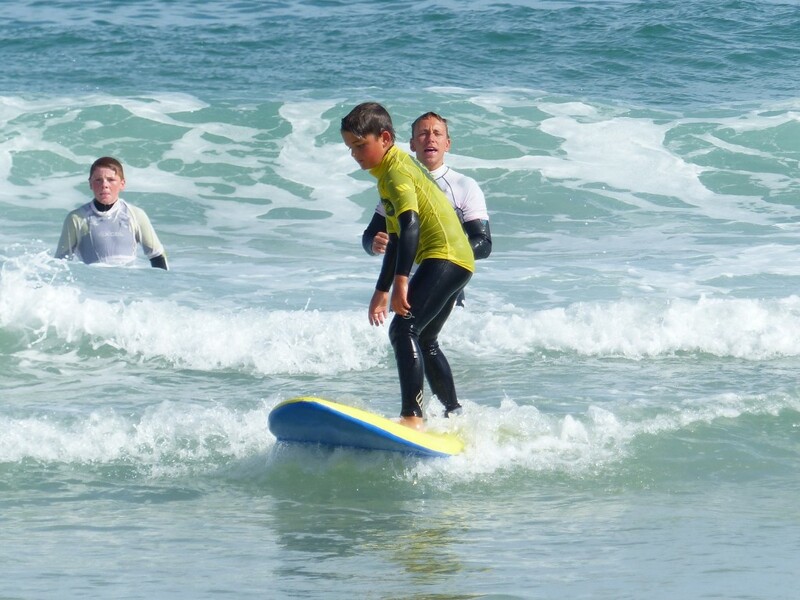 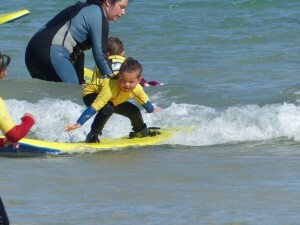 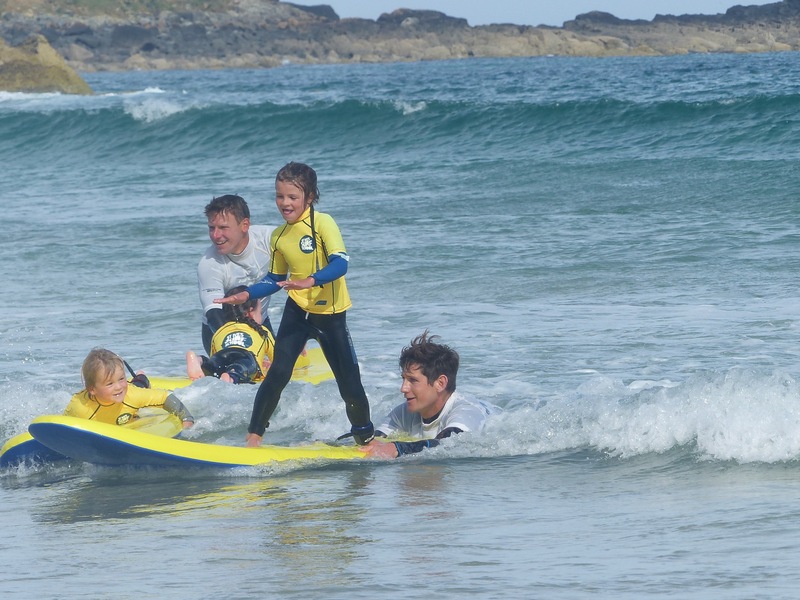 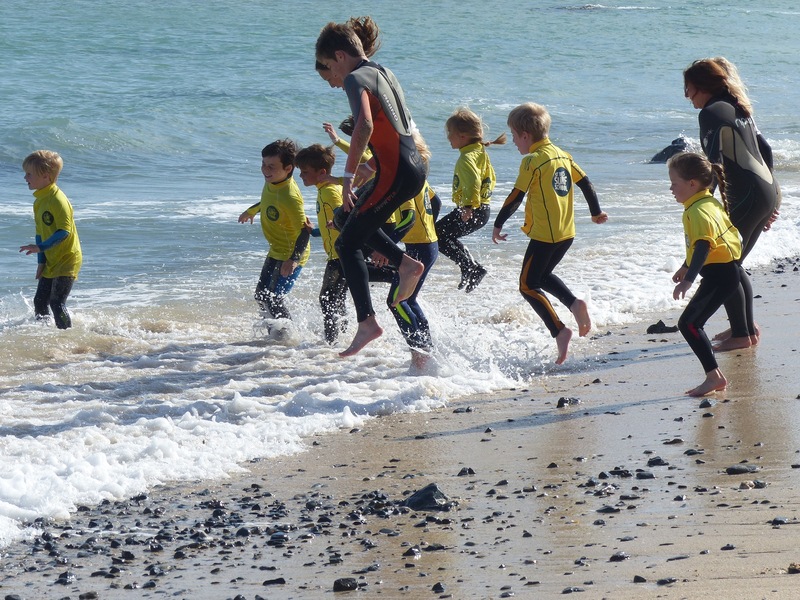 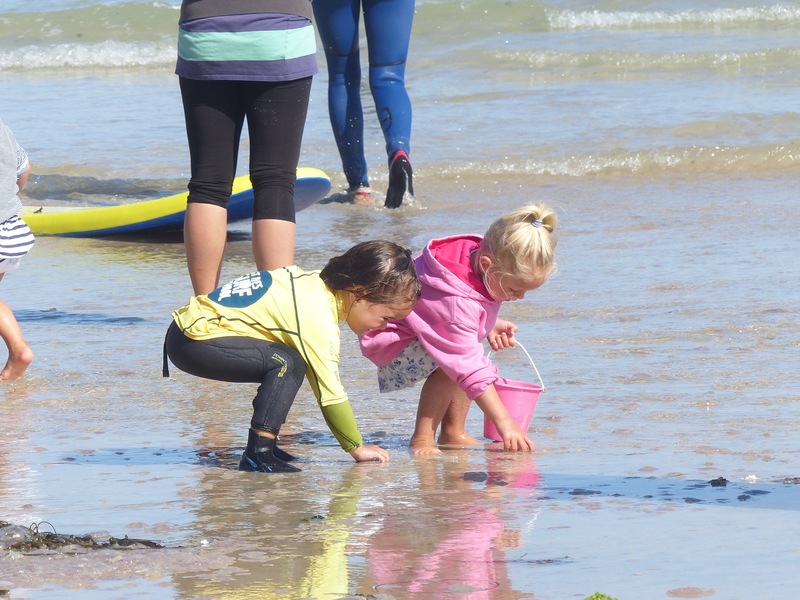 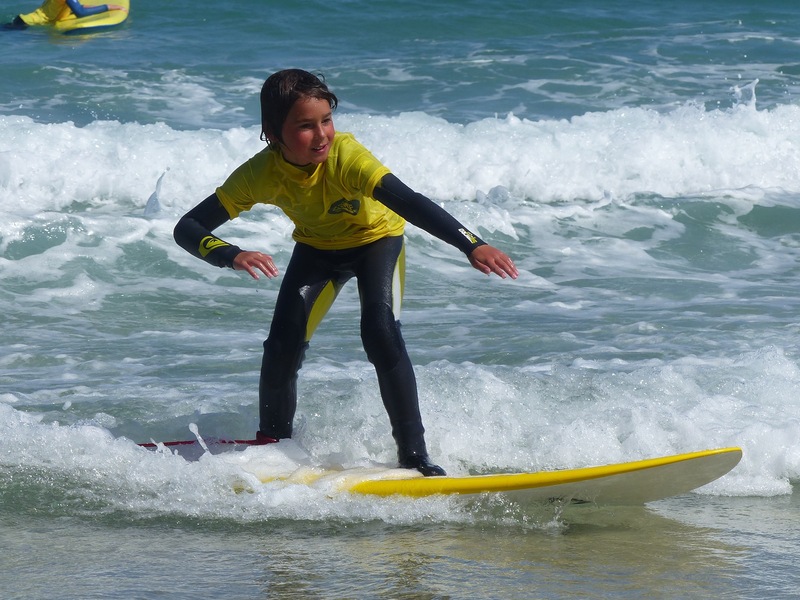 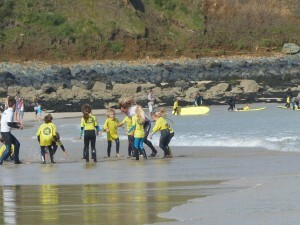 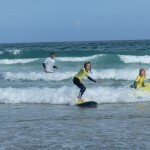 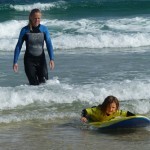 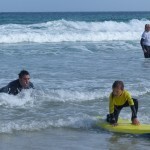 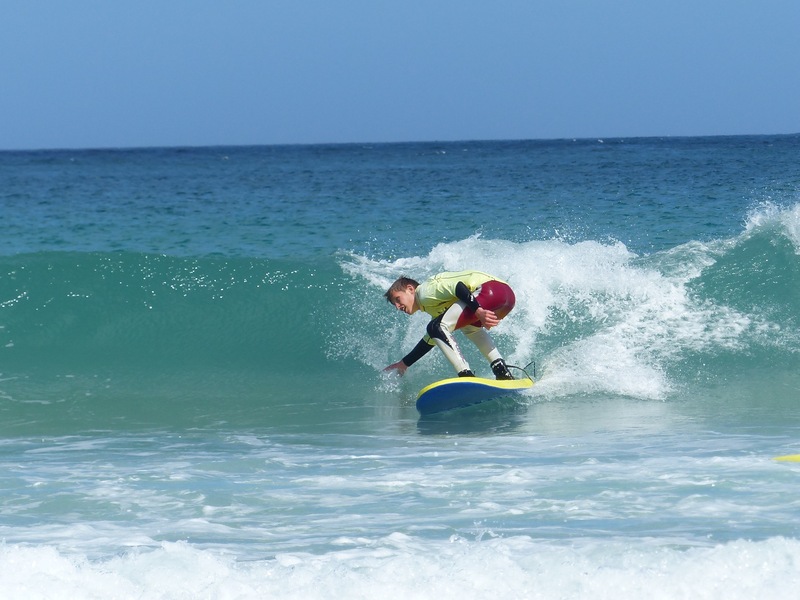 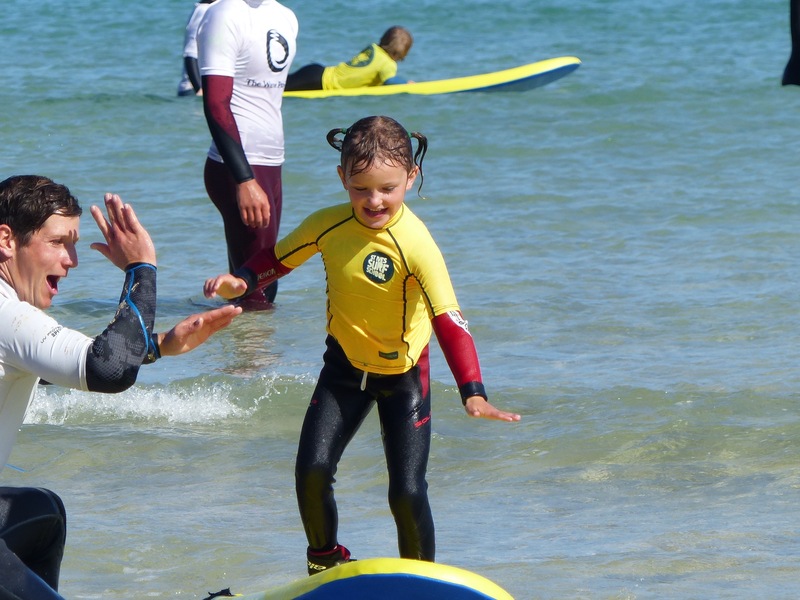 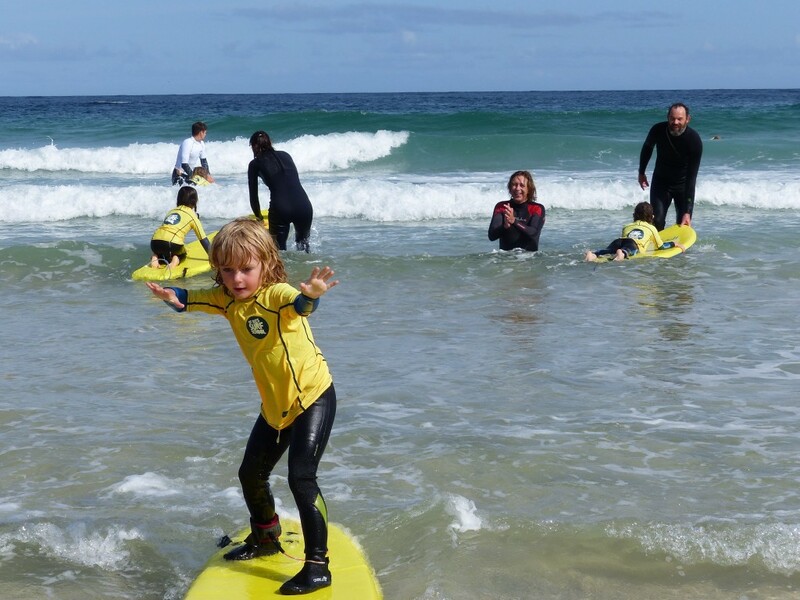 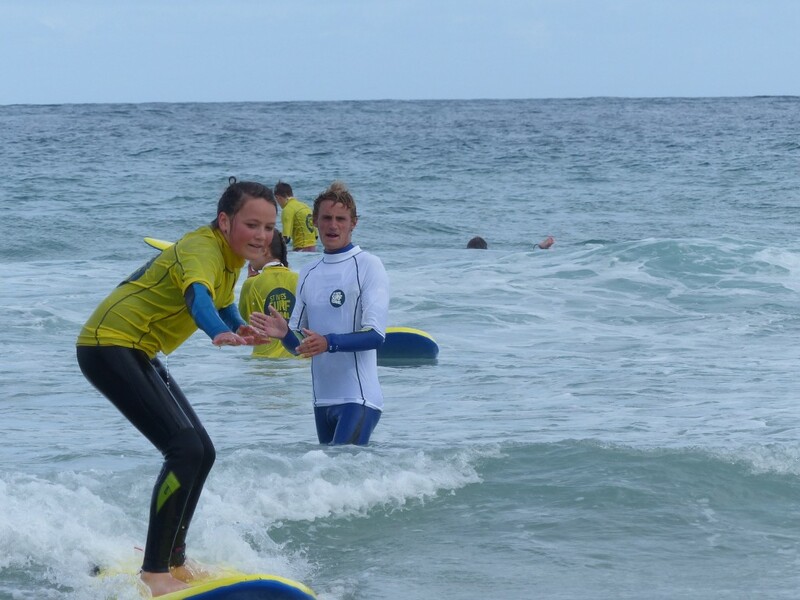 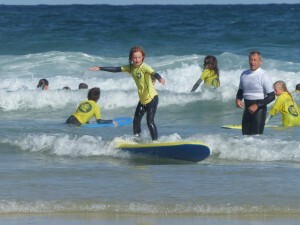 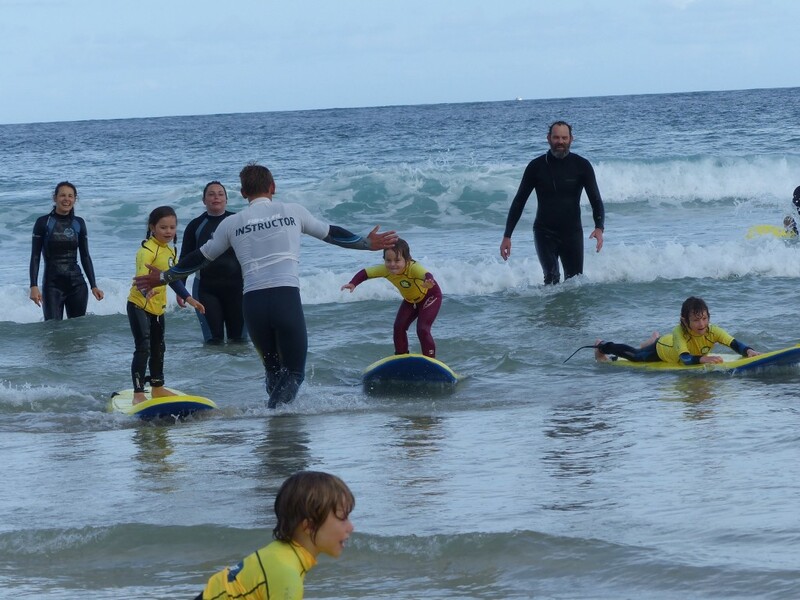 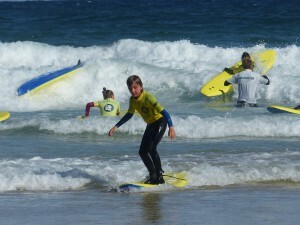 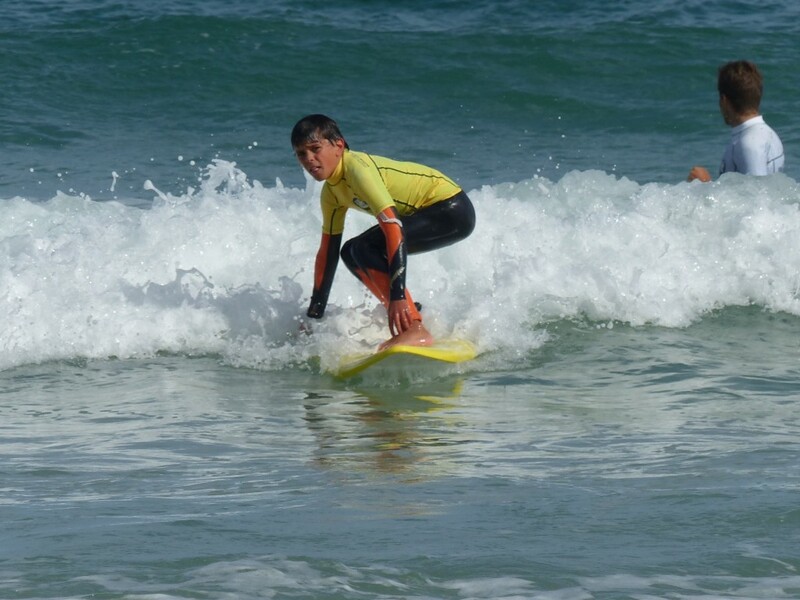 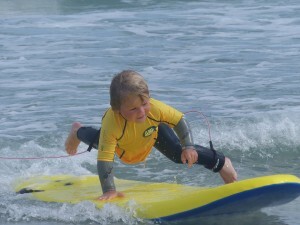 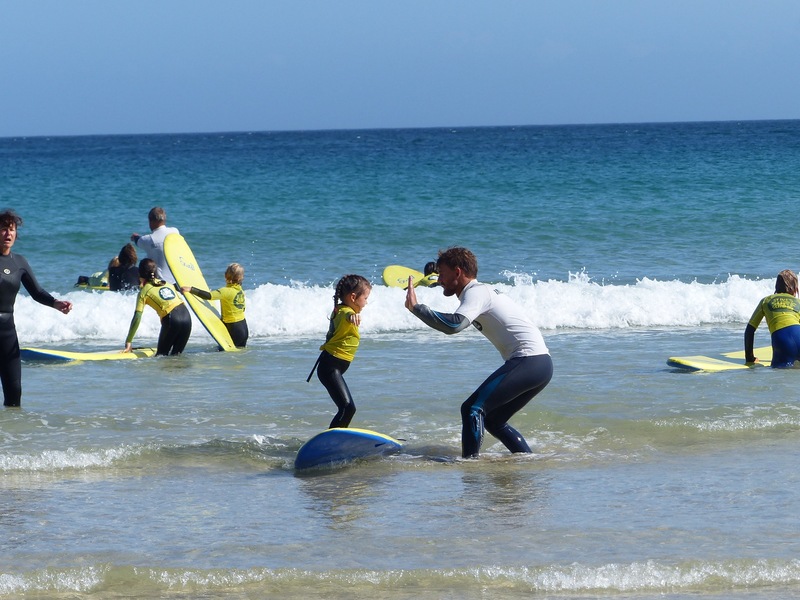 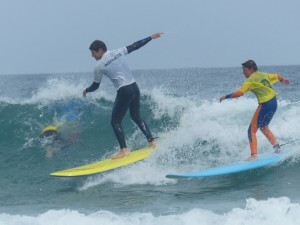 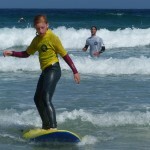 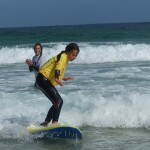 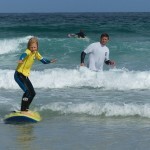 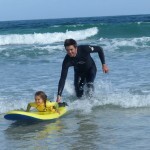 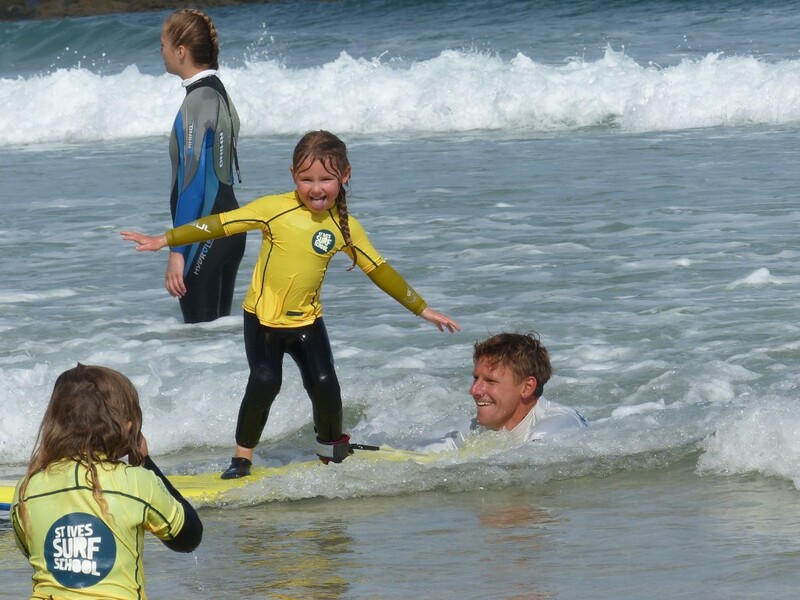 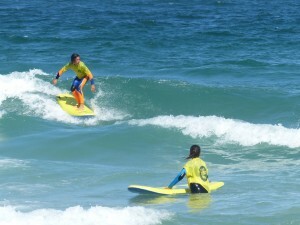 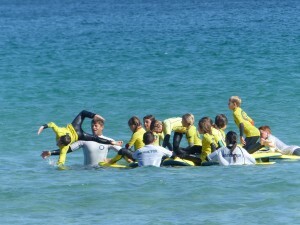 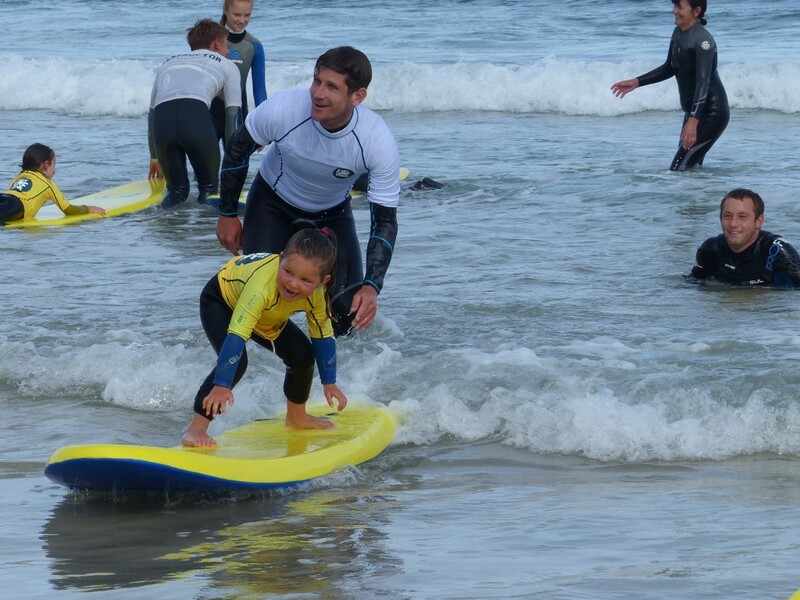 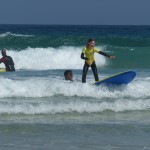 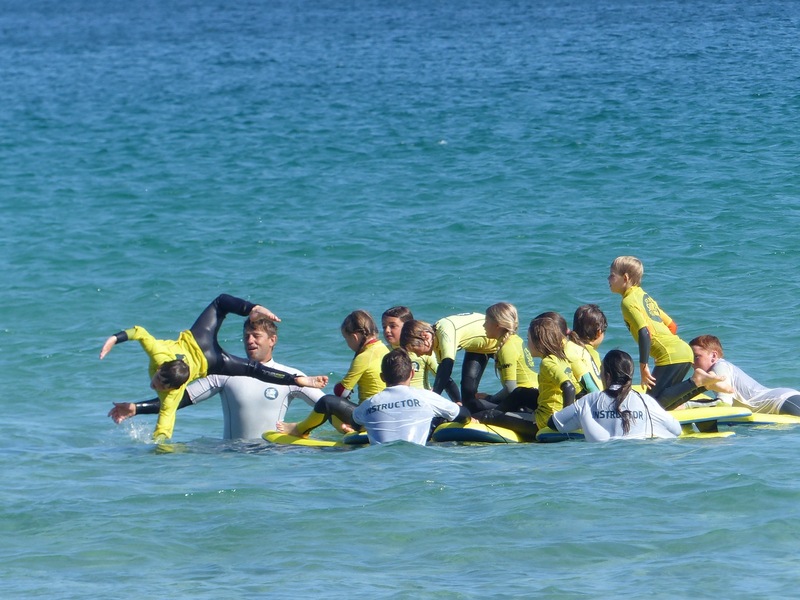 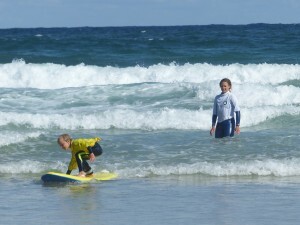 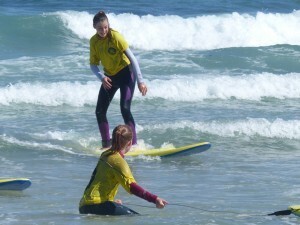 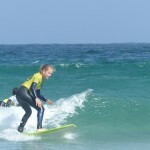 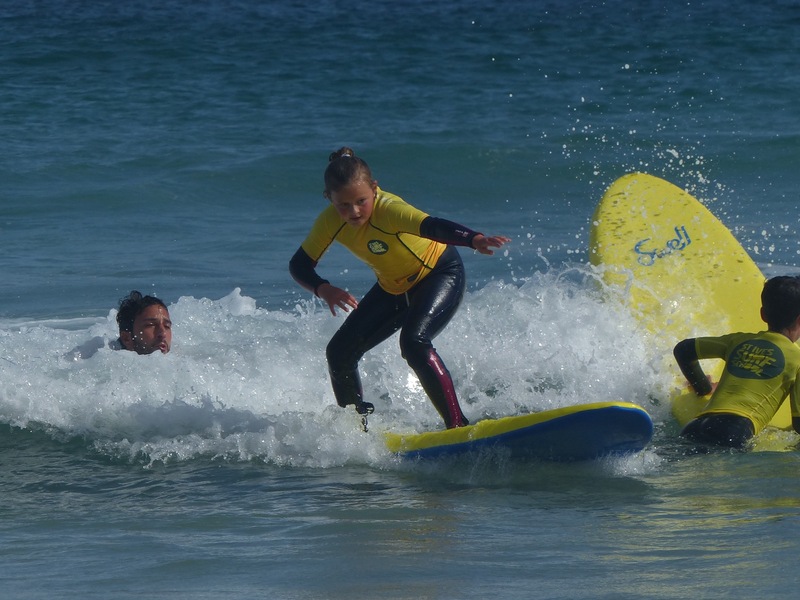 June 27th was mega with 117 surfers that morning, and yesterday was close behind with 100 kids getting in the water! 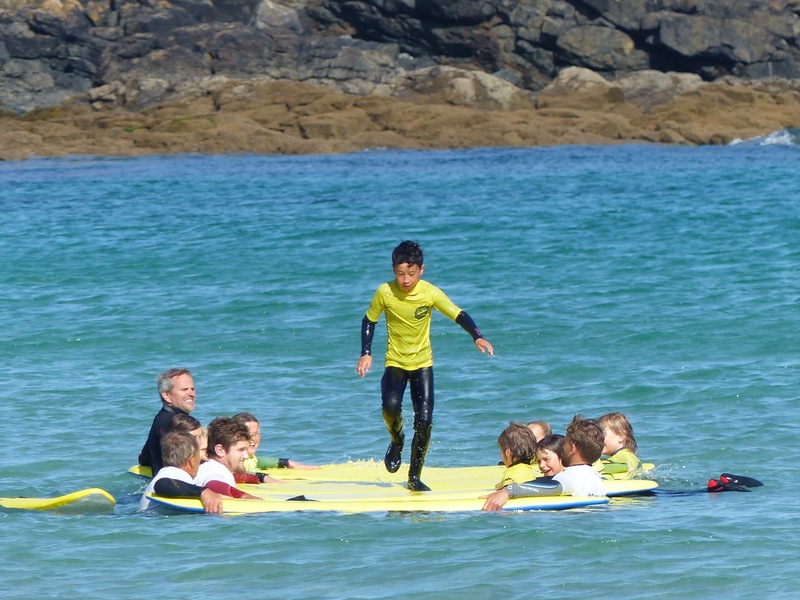 That June day brought some punchy 2 foot waves which challenged everyone to bring their ‘A’ game to the water, while yesterday began with raft-building on a flat ocean before a clean foot-high swell rolled in allowing the Nemos in particular to show off their newly-acquired skill. 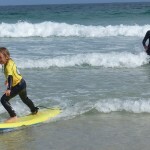 Matty’s Hokey Cokey warm-up with porcupine quill tresses! 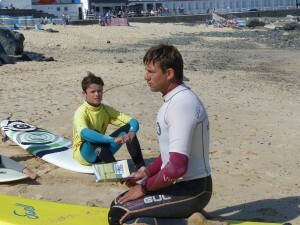 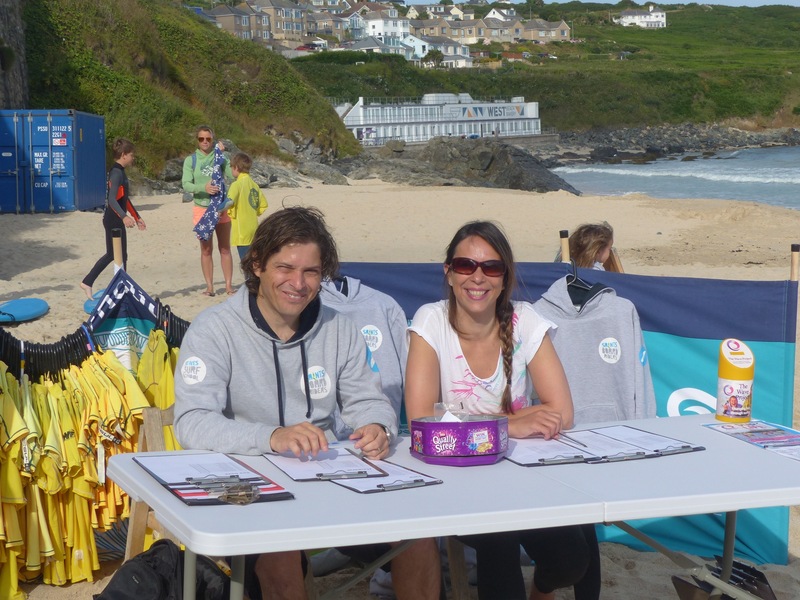 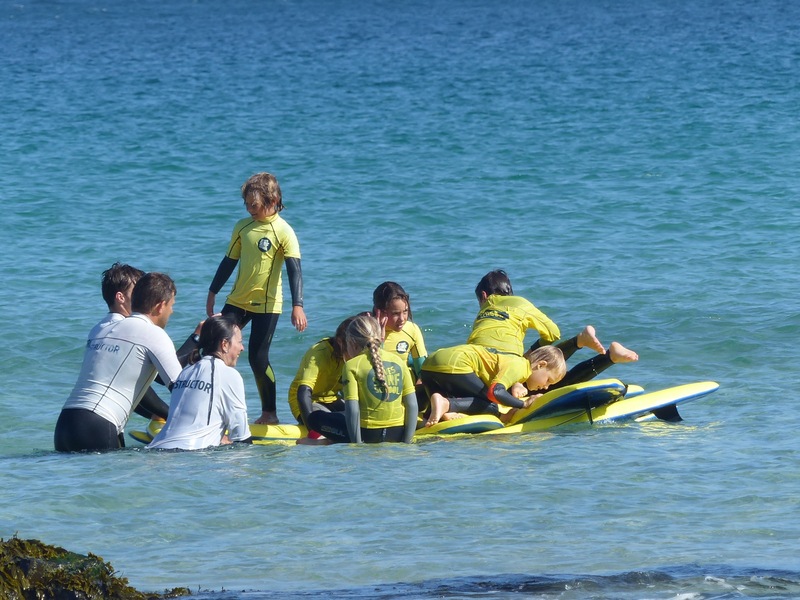 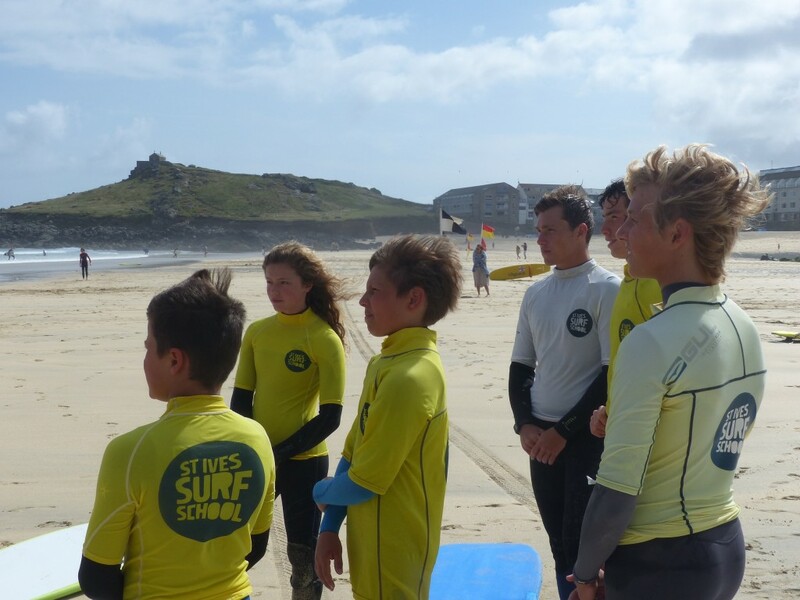 It’s been great seeing how well the safety information is being absorbed at the pre-surf prepping and warm-ups. 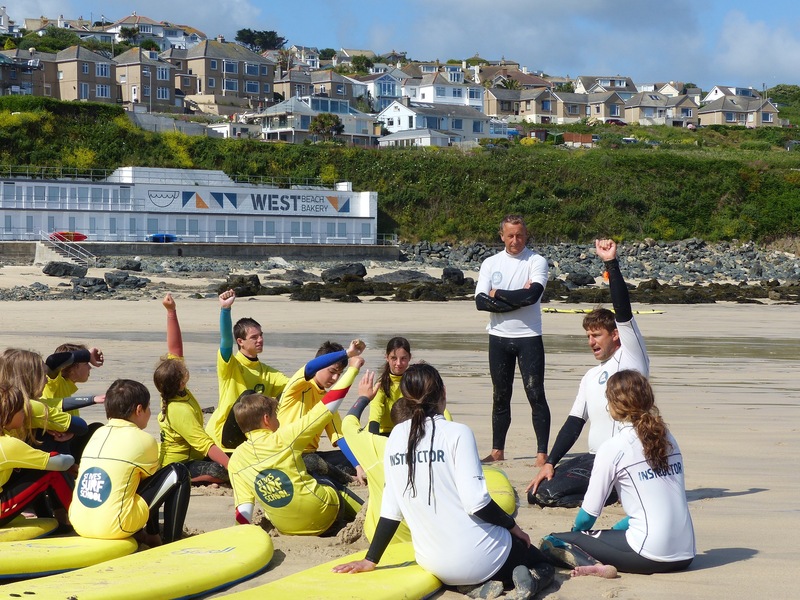 The best feedback an instructor can get is that forest of hands shooting up when he asks the group a question. 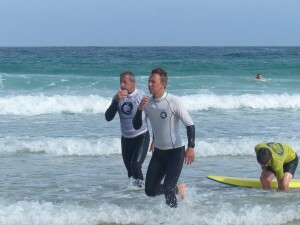 And there has been some good progress in the water too! 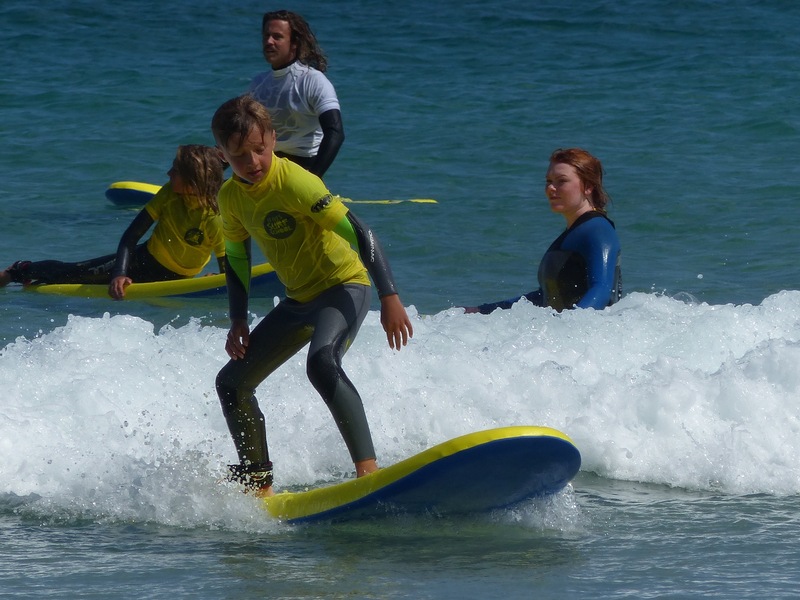 Hopefully the waves and the weather will continue to co-operate and we can cram as many Saturday sessions as possible into this summer.